"Lovely flavours" our friend Ken would exclaim. I'm sure Ken doesn't realise that his compliments to the cook has encouraged me to seek, understand and experiment with flavours. Returning to Dunedin last weekend I was looking forward to some good southern hospitality and an opportunity to bring a taste of the south back to Auckland. goodies such as garlic and cider vinegar to keep the pigs happy and healthy. 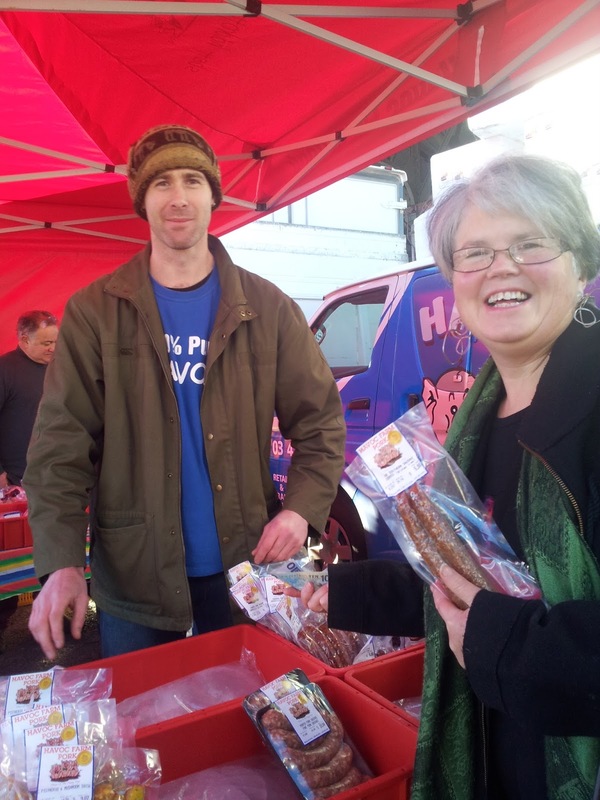 A visit to the Otago Farmer's Market on Saturday gave me just too many choices. This market is one of the best in the country not only for the range of produce on sale but for the southern warmth and openess of the stall holders. I enjoy taking time to talk to those growing or making the products because it's an opportunity to learn something new. I had to be sensible. I couldn't take my usual market haul back home on the plane but the Southern Sausage from Havoc Pork was a "must have". This delicious spicy smoked sausage is more like a salami than a sausage. I have been known to allow it to take part in four different meals so it's really good value for money. 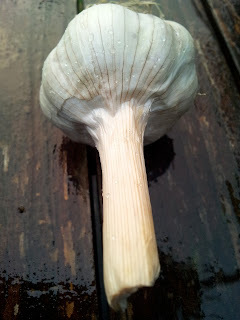 "Hard necked garlic" is reputed to be the original garlic. Through the process of selection the thick stem was replaced with the more popular soft stem variety that can be plaited and better suited to warmer climates. Wairuna Organics say this garlic has a stronger flavour than other varieties. It has fewer but larger and more even sized cloves. I am keen to try growing it up in Auckland to see how it dries up here where humidity reins. I am always on the lookout for a different variety of apple or pear to try. My favourite organic fruit supplier will take the time to talk flavours of the fruit he sells. 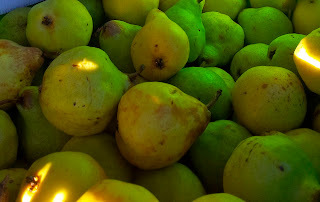 He told us that the above pears were grown on pear stock and that most pears are grown on quince stock. Why? Because pears take longer to grow than a quince... so I couldn't resist a small bag of what he calls Choral Pears. I regret that I did not bring back a swede. It would have been guaranteed a southern frost to make it sweet. I feared the swede may have tipped the scales at Air New Zealand so alas it didn't come north. Market Chef, Alison Lambert, demonstrates how to create delicious, no fuss ways of using the produce at the market. Alison has amazing energy and passion about regional and fresh food. 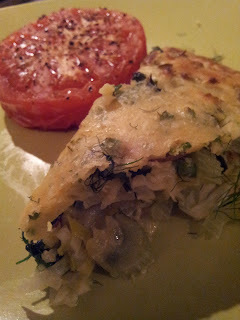 I managed to have a brief exchange with her and sampled a delicious way of using cabbage in a novel way - inside a galette. Galette is a French word that means "a flat freeform crusty cake"
The crust is made by a batter similar to a Yorkshire pudding. 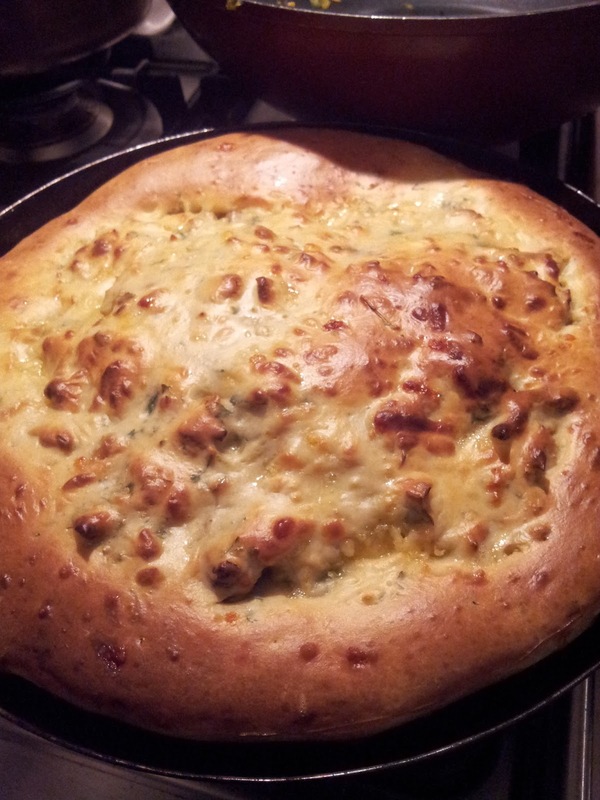 It has all the comfort of a pie, with less effort and no butter or oil - just a little cheese. I took Alison's recipe and added my own touches to the filling to show how easy it is to use whatever you have in your fridge. If you want to see the original recipe go the Otago Farmers Market website. To achieve the best results you really need a caste iron pan that can go into a hot oven. I don't have my iron pans up here but I do have an excellent thick steel pan about 23cm so I slightly modified the recipe to deal with this. You can use ceramic or metal dishes but to get an excellent crust you really need the heat retention that caste iron delivers. First of all turn on the oven to 180 to 200C and place your pan in the oven to heat up. Then start preparing the greens. 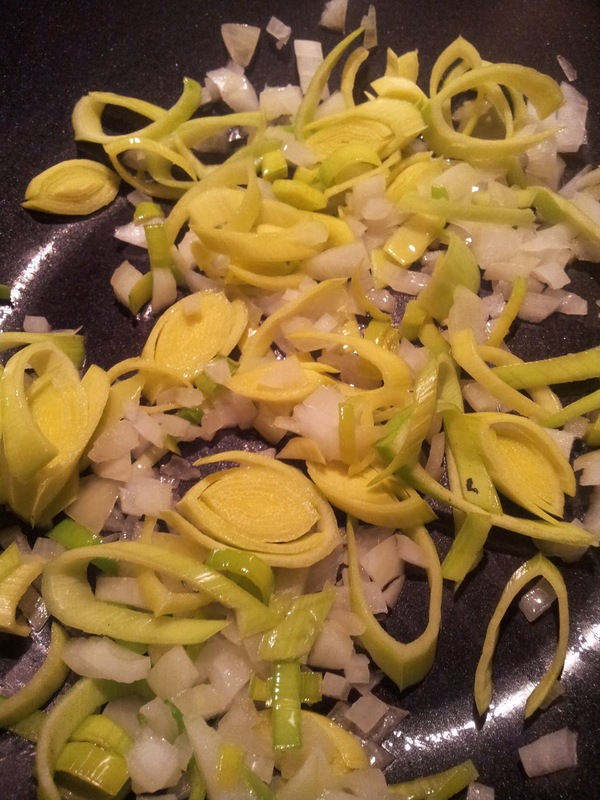 I saute or sweat an onion and/or a leek until soft but don't allow to colour. 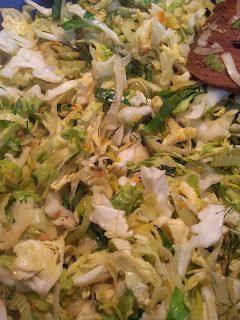 Add sliced up cabbage, kale, brussel sprouts, silverbeet or any other green vegetable like broccoli or beans. I added a fennel bulb from my garden and I used some of the feathery greenery as added flavouring. I had half a dozen small mushrooms left over and I could have added some celery. I found some fresh tumeric the other day so grated about a teaspoon of tumeric into the cabbage mix which adds colour and its unique health properties. 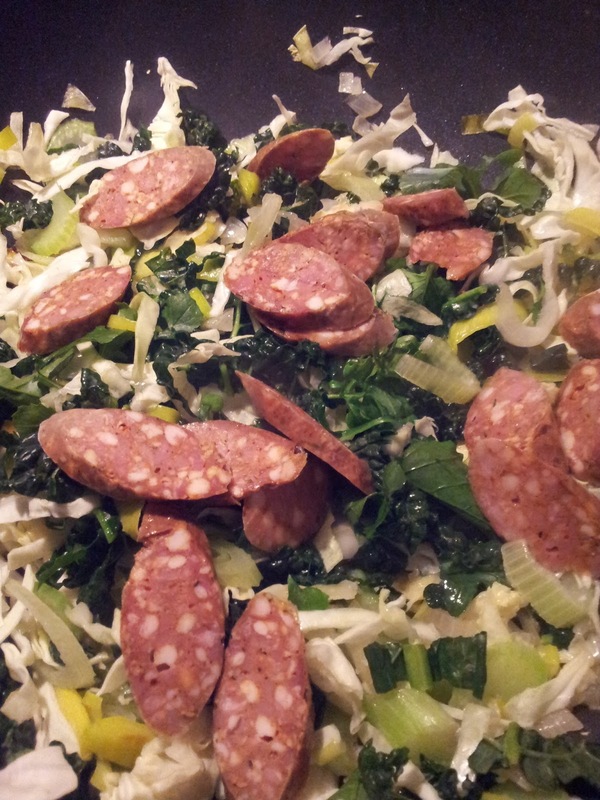 You need 4-5 cups of cooked greens and Alison suggests 400-500g of savoy cabbage. Cook until softened. This only takes a couple of minutes. Season with salt and pepper to taste. 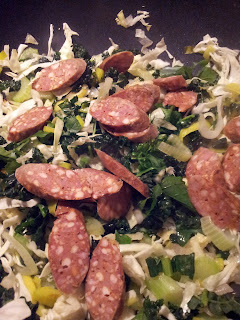 You can enjoy this as a vegetarian dish but I took the opportunity to add some of my Havoc Southern Sausage. Alternatively add some curd cheese (sold at the market by Evansdale Cheese) or feta cheese. 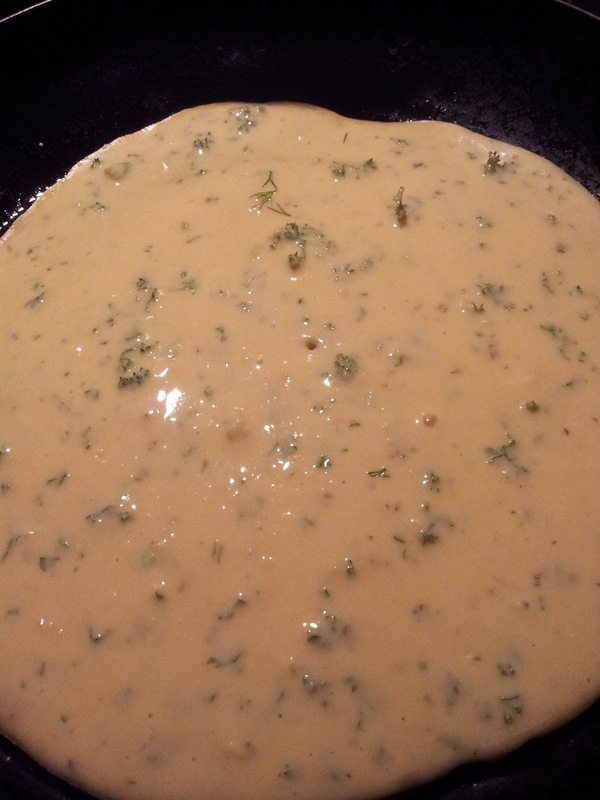 Now its time to prepare the batter. Beat 3 eggs, add 300 ml of milk and 2 cups of plain flour. Beat until smooth. 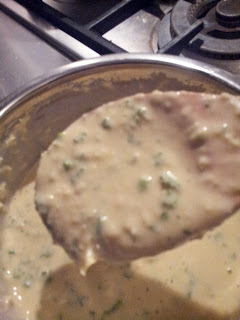 Add a generous handful of chopped parsley, 3 cloves of garlic finely chopped and 50g of grated cheddar or parmesan cheese. Salt and pepper to taste. to stick to the cabbage. Take out your very hot pan, spray with oil and pour half the mix to cover the base of the pan. The steel pan I was using would quickly lose heat so I placed the pan on a low gas flame while preparing the galette. See the small bubbles appearing like it does for a pancake. 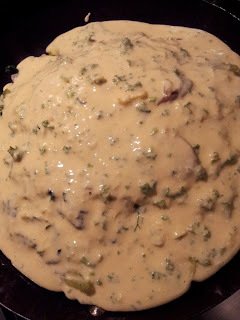 Pile the cabbage filling on top of the batter base and then pour over the other half of the batter to cover the cabbage. This stage looks most unattractive but magic happens over the next 30 minutes. Return to the hot oven for about 30 minutes or until the surface is firm and a golden brown. I served this simply with halved beefsteak tomatoes baked in the oven with a drizzle of olive oil and seasoned with salt and pepper. They are perfect flavour companions. 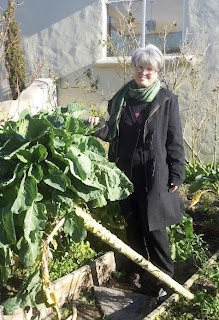 Talking of cabbage... Peta who is looking after our garden at Broad Bay asked me what this giant brassica was. I had no idea where it came from. It could be a cross between a cabbage and a brussel sprout from the neighbours. She is keen to let it flower and gather the seeds as it would be a great forage plant for her hens. lean from recent storms..it tastes just like green cabbage. While a lot of the trees in Dunedin at midwinter are bare, my sister Kerry adds a little culinary colour to brighten her small trees in pots. I was lucky enough to spend a couple of nights with Kerry. We decided dinner had to be simple as we didn't want to waste any talking time. 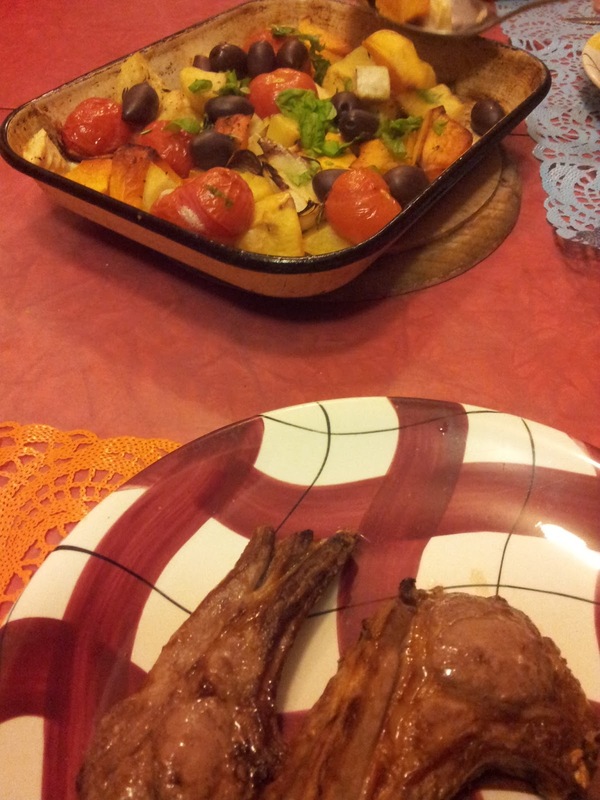 She had a good selection of winter vegies in the fridge and some lamb chops from our brother's farm in Southland. We decided on oven roasted vegetables and grilled lamb. I put the enamel baking dish into a hot oven 180-200 to heat while I cut up potatoes in wedges, a parsnip cut in finger sized batons as it would take the longest to cook, an onion cut into wedges, and a wedge of pumpkin cut into chunks. The prepared vegetables went into a bowl and mixed through by hand with a slurp of oil, salt, pepper and some rosemary (about 2 tsp) chopped up to release the oils. I then spread out the vegetables onto the sizzling hot oven dish and put back in the oven as quickly as possible. Heating the dish allows the vegetables to cook quickly and ensures the potatoes have a crispy skin. Oiling the food rather than the dish avoids the oil burning. Cook for 20-30 minutes. Kerry gave our vegies an Italian touch by adding halved tomatoes and olives in the last 10 minutes and sprinkling chopped basil before they were brought to the table. The lamb chops were put under the grill at a high temperature and turned over as soon as they browned. 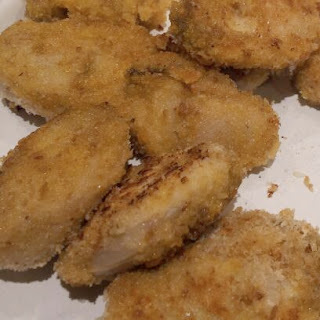 This allows them to remain pink in the middle but crispy brown on the outside. Simple but oh so delicious! 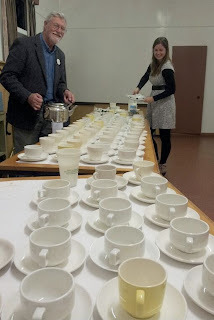 We travelled to Dunedin for two launch events of Peter and Rod's book "An Extraordinary Land" The first event took place in Portobello Hall where the classic giant teapots were put into action for supper. It's difficult to get the tea just right in such massive teapots. Too few or too many tea bags can mean the difference between a good cup of tea and an unsatisfactory one. I just couldn't resist this photo opportunity. 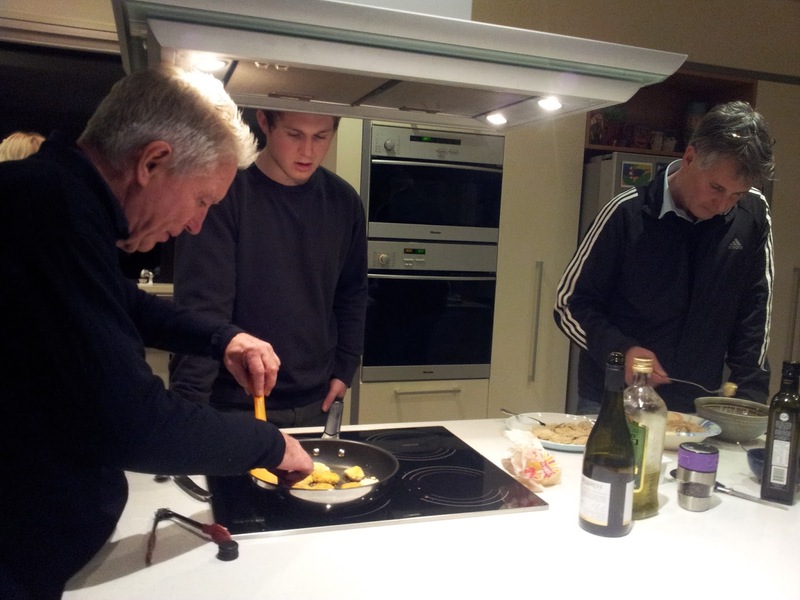 It's not often you see the males of our family taking over the kitchen, except when there is the promise of Bluff oysters. I loved that moment of concentration I caught on camera. Bluff oysters must be the ultimate and perhaps best known flavour of the south. A new flavour has appeared at the Farmer's market though. 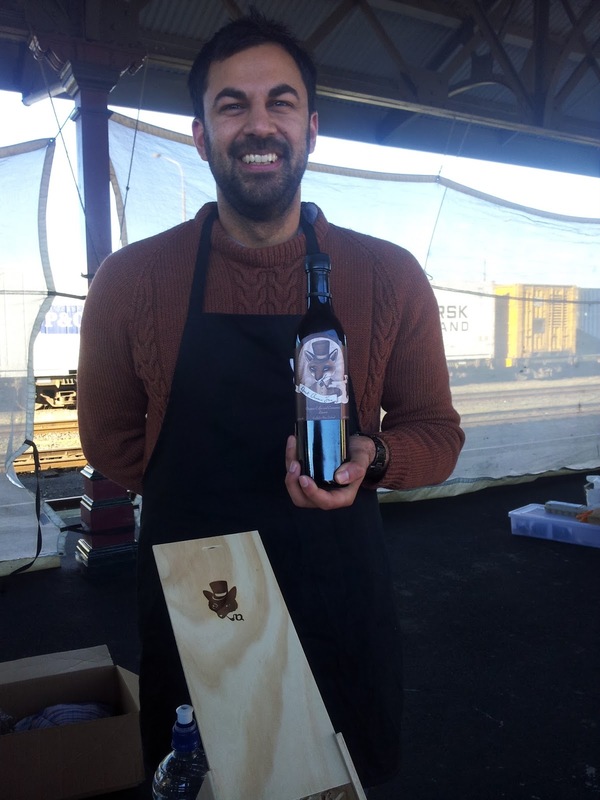 Creator of Quick Brown Fox, Arjun Haszard, can be found there most Saturday's giving out taste samples of his Coffee Liqueurs. It's the most devine tipple for those of us who love coffee and cinnamon...even at 10 in the morning! We admired the artwork on the bottles and Arjun told us he opted to employ an artist rather than a graphic designer to do his labels. I first heard about Quick Brown Fox and Arjun through a video made as part of Insiders Dunedin. It's a beautifully crafted short film that will show you Arjun at work and talking about how he likes to do business. Arjun has set me a challenge - to come up with a recipe using QBF. If he likes it he will add it to his blog. So armed with my latest favourite book "The Flavour Thesaurus" by Niki Segnit, I am going to create something special using local foods to complement that deep rich coffee and cinnamon flavour. And while experimenting I will be thinking "What would Ken think of this flavour?. 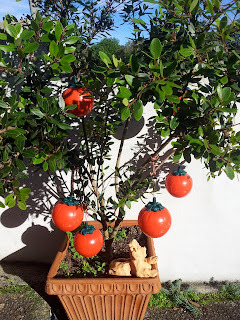 I hope you too have had a Ken in your life encouraging you to be creative with food. Otago Farmers Market is trademarked without the apostrophe. Thanks.